This blackcurrant cheesecake recipe is the perfect dessert for using up a glut of these delicious summer berries. The cheesecakes have a delicious ginger snap and coconut crust, adding wonderful texture and flavour. Foraging is not an activity that comes naturally to me. Reading through the blogs, it seems that most lucky European food bloggers grew up practically learning foraging at their mother’s knee. Me? I learned fear at my mother’s knee! My parents took great delight in regaling me with stories of unfortunate friends-of-friends-of-friends who went mushroom picking and were found dead from some fungal neurotoxin the next day; or people who went camping and innocently made kebab skewers out of poisonous oleander twigs, who were found slumped, barely alive, around their campfire. It was enough to put a person off foraging for life. In fact, the only practical foraging information other than these dire warnings that I remember getting was from my parents’ old friend Bob who once told my brother and me: “berry red – go ahead; berry white – take fright” - which is hardly advice I’d stake my life on! I still remember my stunned surprise when, during our first year in this country, we went on a boating holiday on the Norfolk Broads and coming across a bramble bush heaving under the weight of its blackberries during an evening walk along the towpath. At least, I was 99% sure they were blackberries, having never actually seen one outside of a supermarket punnet at that stage! I selected a plump, shiny one, picked it and very tentatively popped it in my mouth. To this day I’m not sure whether the lingering fear of found food heightened my senses; or whether it truly was the sweetest, juciest blackberry in all of England, but the seeds of a foraging future were planted in me that day: wild plums in our local park; blackberries under the power lines between the allotments; wild rocket from the verges near the Royal Docks; and wild cherries on my walk to the station. Although it’s not strictly speaking wild foraging, I also recently had the chance (courtesy of our friends on the neighbouring allotment) to pick my own blackcurrants. Again, my knowledge of these extended roughly to the fact that they are what gives Ribena cordial and cassis liqueur their flavour, but that was as far as it went. Native to northern Europe and Asia, these shrubs have been cultivated for centuries to take advantage of various medicinal uses for the berries (in particular their high Vitamin C content). Similarly shaped but slightly smaller than blueberries, the blackcurrants grow in clusters on fine branches called strings. This makes them easy to pick as you can grab the entire string… but you pay for it later as the berries and strings have to be separated before cooking or eating. You can try the raw berries, but they are very tart, so you are probably better off making them into some sort of dessert with added sweetness. 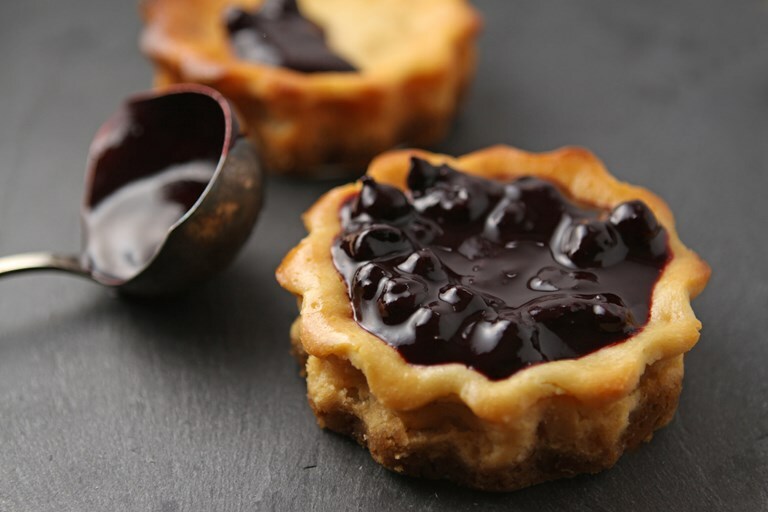 They are the perfect candidates for jams and jellies though because of their high pectin content. 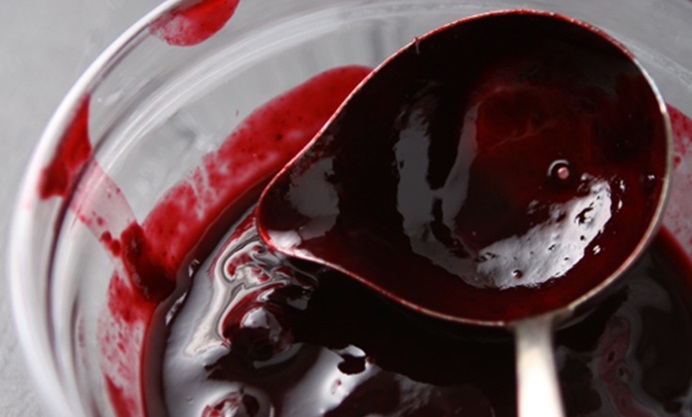 The most common use is to cook the fruit with some sugar, crush, and pass through a sieve to create a thick juicy puree. This can then be added to ice-cream, yoghurt, semifreddo and cheesecakes - which is exactly what I did! Rather than make a large cheesecake, I opted for four mini cheesecakes - but you will need mini loose-bottomed flan tins to do this. 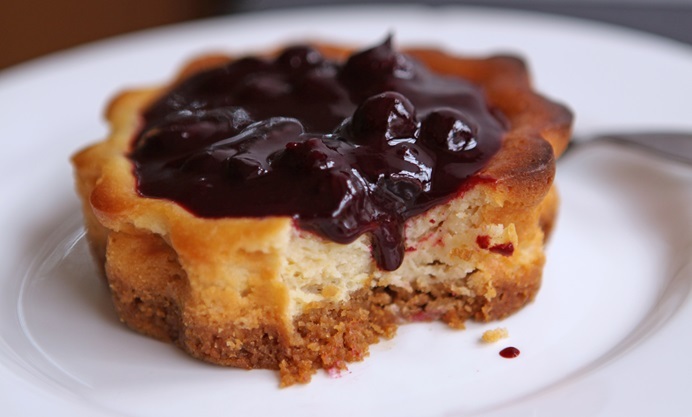 Alternatively, double the recipe and make one standard size cheesecake in a spring-form pan.